Redmi Note 7 Pro Vs Samsung Galaxy A70 Vs Samsung Galaxy A50: Which handset has best Camera, display and CPU & GPU? According to report, Samsung (Korean Smartphone manufacturer) has announced their Galaxy A70 Smartphone which has spiced up the game by providing triple and quad-camera setup. When we talk about the features of this phone, it has in-display fingerprint sensor along with CMOS BSI (Backside illumination) in main camera. It is basically Galaxy A-series of midrange phone which has now higher options. Galaxy A70 has teardrop-notched, 6.7 inch display with aspect ratio 20:9. On other hand, the company’s Galaxy A50 Smartphone in A-series comes with triple camera, U-shaped notch design and 4000mAh battery. It is has also In-display fingerprint sensor as of Galaxy A70. 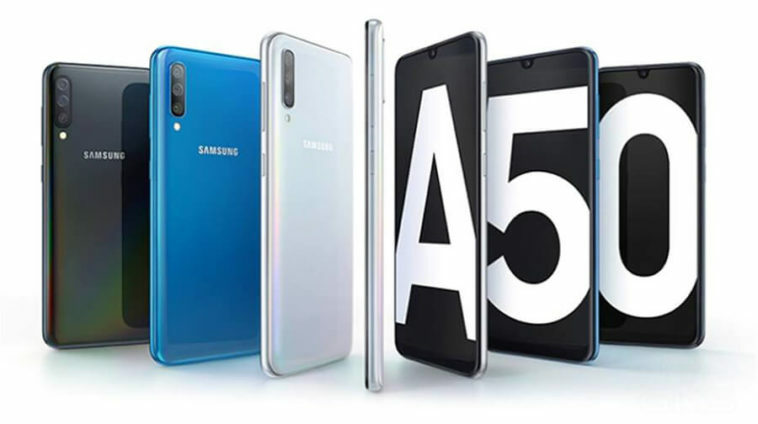 Galaxy A50 has 6.4 AMOLED display panels with aspect ratio 19.5:9 and U-shaped notch on front allows a screen-to-body ratio of 91.6%. 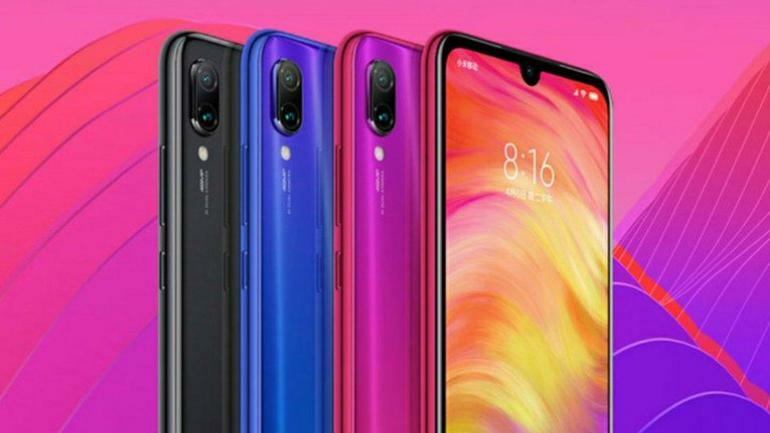 When we talk about another famous Smartphone brand Xiaomi (Chinese Smartphone maker), the company has released their Redmi Note 7 Pro phone which has major features of 48MP dual camera sensor and gaining huge popularity among users. It has 6.3 inch FHD screen which is protected by Corning Gorilla Glass 5 and 2.5D curved glass screen. Here, we are going to discuss about all three phones and trying to find out which one is best. Let’s start the battle Samsung Galaxy A70 Vs Samsung Galaxy A50 Vs Redmi Note 7 Pro. We are seeing that Galaxy A70 has octa-cores including 2x 2.0GHz Kryo 360 and 6x 1.7GHz Kryo 360 while Galaxy A50 has octa-core including 4 Cortex-A73 and 4 Cortex-A53 cores with Mali-G72 MP3 GPU. On other hand, Xiaomi Redmi Note 7 Pro has Qualcomm Snapdragon 675 SoC with 11nm Process. It has octa-core including 2 Kryo 360 cores gold clocked at 2.0GHz and 6 Kryo 460 core Silver clocked at 1.7GHz. From the given detail, we can say that Samsung Galaxy A50 Smartphone has better CPU & GPU configuration than rest ones. If you want high-end features phone but quite stomach price of Samsung Galaxy S10, then don’t worry. Samsung is care about it. 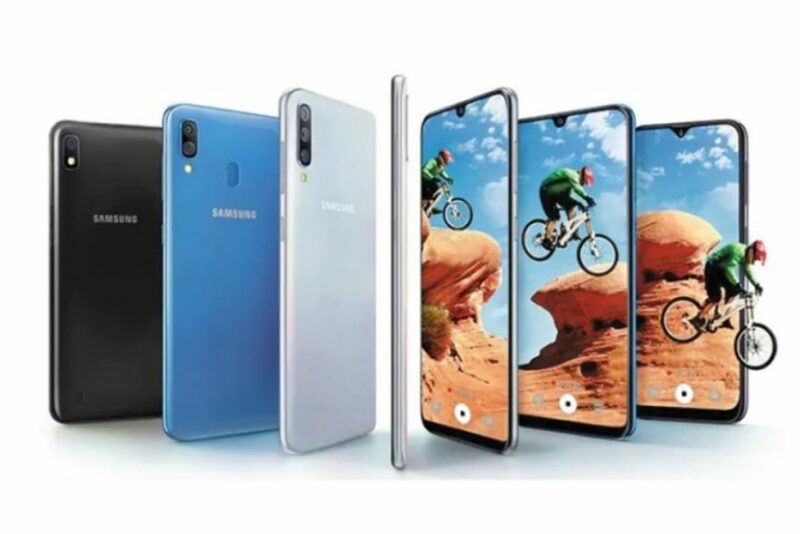 There is an alternative available for you in the form of the newly announced Samsung A70 phone which has 6.7 inch AMOLED display with 1080 X 2400 screen resolution and super-wide 20:9 aspect ratio. Moreover, there is no punch-hole display on Galaxy A70, but it has an in-display fingerprint scanner. When we talk about Galaxy A50 Smartphone, it has 6.4 inch Super AMOLED panel FHD+ display with screen resolution 2340 X 1080 pixels and aspect ratio 19.5:9. Interestingly, it has U-shaped notch on the front which allows the screen-t-body ratio of 91.6% which making it one of the batter Smartphone to consume content on. There is additional layer Gorilla Glass 3 on front of phone which helps to prevent it from scratches and scuff marks. On other hand, Xiaomi Redmi Note 7 Pro has 6.3 inch FHD+ LTPS In-cell display which consumes less power, has fast refresh rates and generates less heat. While we are not sure exactly how big a difference that makes, we can say that there is not compromise on the visuals. There is no notch design as of Galaxy A50 phones makes for 19.5:9 aspect ratio of screen. If you don’t already know, AMOLED panels are punchier and crisp compared to LCDs. Still, off-angle and outdoor visibility are better than we would expect from phone of this price. Samsung Galaxy A70 is triple camera phone which means it has three cameras in rear including 32MP f/1.7 aperture, 8MP f.2.2 ultra-wide sensors and 5MP f/2.2 depth sensor. It has also 32MP front facing camera for taking impressive selfies. On other hand, Galaxy A50 also has triple camera setup including 25MP f/1.7 aperture sensors, 5MP depth sensor and 8MP ultra-wide lens with 123-degree field of view. Samsung has also included features like AR Emoji, Hperlapse and the cameras on Galaxy A50 phone can also recognize different scenes and optimize the picture accordingly. There is hit and miss situation with live focus as the cameras often failed to create depth in an image. It manages to grab some good shots. The major feature of Redmi Note 7 Pro is its camera. Note 7 Pro has 48MP camera f/1.8 aperture, 5MP f/1.8 aperture depth sensor in back of Smartphone. It has also 13MP front facing camera for taking impressive selfies. The phone is also capable to take better photographs even in night sight or night mode support. Other features including Redmi Note 7 Pro’s camera are dual LED light, HDR and Panorama which takes various types of images. 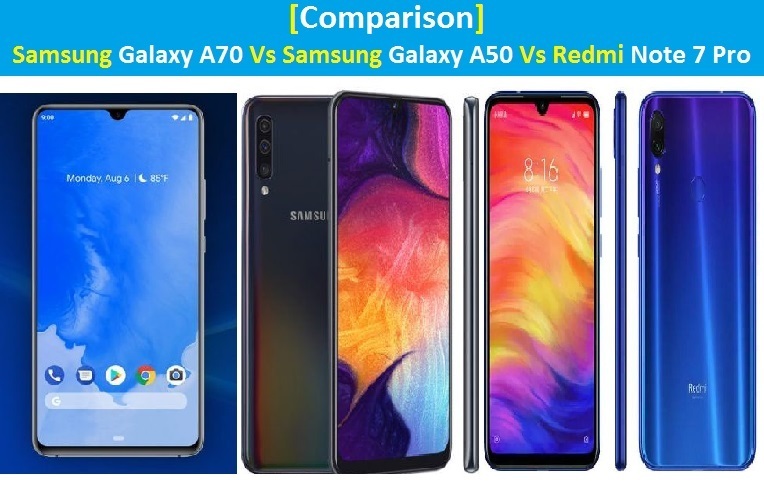 On comparison Samsung Galaxy A70 Vs Samsung Galaxy A50 Vs Redmi Note 7 Pro, we have noticed that Samsung Galaxy A70 and Samsung Galaxy A50 both have triple camera setup, but Galaxy A70 comes with 32MP + 8MP + 5MP camera configuration while Galaxy A50 comes with 25MP + 8MP + 5MP camera setup. So, we can say that Galaxy A70 has better camera options. On other hand, Xiaomi Redmi Note 7 Pro has 48MP camera in back. So, if you are looking for best phone with 48MP camera sensor, then Redmi Note 7 Pro can be best options for you.What do you think? Which one is best Smartphone? You can share your own experience on the comment box given below.